WASHINGTON, D.C. -- Americans' confidence in the economy continues to gradually strengthen after last month's post-election surge. 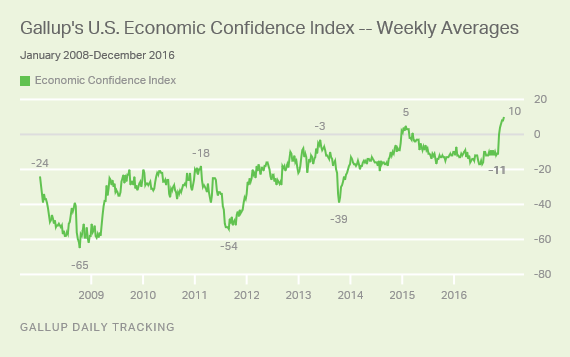 Gallup's U.S. Economic Confidence Index averaged +10 for the week ending Dec. 18, marking another new high in its nine-year trend. The latest figure is up slightly from the index's previous high of +8 recorded in both of the prior two weeks. 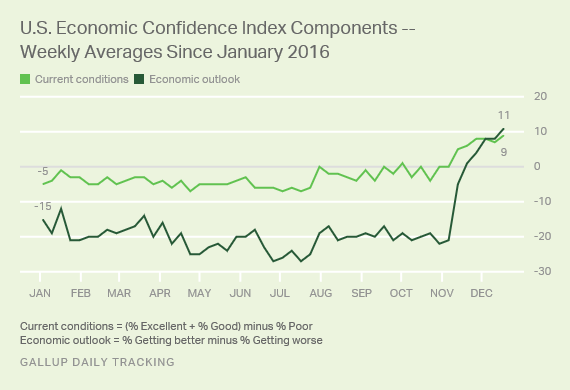 The first positive double-digit index score since the inception of Gallup Daily tracking in 2008 reflects a stark change in Americans' confidence in the U.S. economy from the negative views they expressed in most weeks over the past nine years. Last month's election of Donald Trump not only marked a change in the country's political power structure but also significantly improved Republicans' economic confidence -- pushing the index into positive territory for the first time since March 2015. Americans' assessments of current conditions and their outlook for the economy are the most positive they have been in nine years. Thirty-one percent of Americans rated the economy as "excellent" or "good" last week, while 22% said it was "poor," resulting in a current conditions score of +9. The latest economic outlook score of +11 is the result of 53% of Americans saying economic conditions in the country are "getting better," and 42% saying they are "getting worse." The new political course for the U.S. has spurred public confidence in the economy, but Americans also have other solid reasons to feel optimistic about the nation's economic health. After a strong third quarter report from the Commerce Department and the lowest unemployment rate in over nine years, the Dow Jones industrial average flirts with a record-breaking 20,000 index score. If Americans' confidence persists or even increases in 2017, it could mark a strong first year for the incoming president. But it wasn't long ago that Americans' views of the economy were decidedly negative, and their confidence has been known to retreat in the midst of national political drama -- serving as a reminder that confidence is fragile. Economic confidence is higher than Gallup has seen in years, but it could slip once Trump takes office. While Republicans' confidence is likely to remain high and could even improve in 2017, Democrats' confidence could plummet further than it already has once they attribute current economic conditions to Trump's administration. At that point, Democrats' confidence score could become negative, offsetting some of Republicans' post-election enthusiasm. On the other hand, continued improvements in the economy could decrease economic partisanship, which would provide a positive backdrop for the new administration. Results for this Gallup poll are based on telephone interviews conducted Dec. 12-18, 2016, on the Gallup U.S. Daily survey, with a random sample of 3,549 adults, aged 18 and older, living in all 50 U.S. states and the District of Columbia. For results based on the total sample of national adults, the margin of sampling error is ±2 percentage points at the 95% confidence level. All reported margins of sampling error include computed design effects for weighting. Americans' satisfaction in 2016 with the way things are going in the country is similar to levels in the past four years but lower than the historical average since 1979.